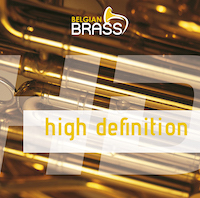 ‘High Definition’ was created in 2011 as a full evening’s performance centred around brass instruments, percussion, synthesizer and film music, commissioned by Belgian Brass. The challenge I imposed on myself as a composer/arranger was to create one coherent piece of music, in which associations were to play a major part. I grouped numerous legendary soundtracks into seven parts and a finale, which all blend into each other. This grouping was based on substantive associations between the different films: similarities with respect to themes, cast, nationality, genre or general atmosphere. Musical associations also play an important part in the structure of ‘High Definition’. I often try to unite musical material from two or three soundtracks into one new musical structure, thus expressing the associations between the different films in terms of music as well. I also added my own, personal musical association from Western music history to certain parts. For example, in the fourth part, ‘Le massacre du sacre’, fragments from Stravinsky’s legendary ballet ‘Le Sacre du Printemps’ have been interwoven with melodies and harmonies from films such as Gladiator (2000) and Mission Impossible (1967), and in the fifth part I used the structure of a Praeludium and Fugue from Bach’s Well-Tempered Clavier in combination with musical material from the score of Jurassic Park (1993). The associations between the various film scores are reinforced by some tapes that have been processed in the music. The tapes are collages of spoken excerpts from the films that served as a basis for ‘High Definition’. The work opens with a short overture. The musical material of this overture can be found in all parts of the suite and achieves a grand development in the finale. In this way I want to enhance the cyclical unity of the work. The main reason for making this CD was the first concert played on Bruges’s restored carillon together with Belgian Brass on 12th June 2010. The two chorales by Johann Sebastian Bach (1685-1750) on this CD were played during this concert. Bruges has a long history when it comes to brass players. As early as in the 14th century, Bruges employed its own minstrels (trumpeters and pipers). During a number of grand festivities, the brass sections counted over 20 musicians. It is more than likely that Intrada’s like that of Girolamo Fantini (1600-1675) were played here in Bruges at that time. The city musicians kept in close touch with their colleagues from other cities. Joris De Vinck (who worked in Bruges from 1528 until 1543) succeeded his Antwerp colleague Tielman Susato (1510/15 – approx. 1570) in the same profession. Clearly, he must have been familiar with the Dansereyen (dance music). Merely a few years later, some of the more than one hundred dances from Terpsichore (1612) by Michaël Praetorius (1571-1621) can be found in a carillon book for the automatic carillon in the Saint Nicholas Church in Brussels. The Dance suites by Claude Gervaise (1540-1560) and the Sarabande by Johann Christoph Pezel (1639-1694) also circulated in Europe. Of course, the overwhelming, festive music from Dardanus by Jean Philippe Rameau (1683-1764) has no connection with the city music: here, we can only admire the virtuosity of Belgian Brass. After the success of “Pushing the Limits” and “Russian Heritage”, we were convinced to continue and record a third CD. This time we chose to enlighten the ensemble from a total different angle: no arrangements from existing symphonic music, but new original compositions for brass and percussion! 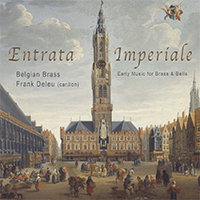 Flanders has always been a source of very talented contemporary composers, and now the time had come to put them in the spotlight in combination with Belgian Brass. 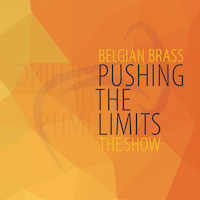 From the start in 2004, Belgian Brass is an ensemble that ‘s always looking for a musical challenge, reaching further and evolving. The composers already knew the ensemble and therefore they had a good idea in how far they could go in their composition. They succeeded and the result is amazing. More so, because the compositions are very diverse, “From IO to Dandi” has taken a new step in the revealing contemporary repertoire. The union in the diversity of the compositions has resulted in a unique sound and colour, all brought together in this new CD. It was also an enriching experience for the musicians and they are very proud to present to you the final result. The Dandi March was an act of peaceful protest against the British salt taxes in colonial India. This walk for peace, justice and freedom was the beginning of the independence for the Indian people. On the 12th of March 1930, a 60 year old Indian man, wearing a white cotton drape and sandals, started a walk of 370 Km to Dandi, Gujardt, a little town at the Arabic sea. This man, named Ghandi, wanted to gain salt out of the sea and by doing so, breaking the British law. 78 others accompanied him. The interest for the march was huge. Four districts and 48 villages were decorated in the colours of India. Bystanders kneeled down for the procession. A few times a day, Gandhi and others spoke to the crowd. Continuously more and more people followed. After 24 days, more than a thousand people reached Dandi. Once arrived they started to sing “Raghupati Raghav Raja Ram”, the favourite hymn of Ghandi. The morning after, Ghandi took some salt from the sea, left on the shore by the waves and said: “With this, I am shaking the foundations of the British Empire”. During the night of May 4th Ghandi was sleeping under a Mango tree in a village nearby Dandi. Just after midnight, the District Magistrate, accompanied by 2 officers and 30 heavily armed soldiers, arrested Ghandi. Ghandi, known worldwide and leader of the Indian people.He showed that resisting the colonial ruler also was effective without violence.In a powerless country, he became the symbol of strength and self-confidence. Seventeen years after the march to Dandi, the independence of India was a fact, but it wasn’t a triumph for Ghandi. British India was torn into two: The Hindu state India and the Muslim state Pakistan. Hundred thousand people were killed because of the violence between Hindu’s and Muslims. Ghandi as well was murdered by a fanatic Hindu. Worldwide he was considered a great man, possibly the most impressive one of the 20th century. “The Great Procession” is the consonance of the 24 days from Sabarmati to Dandi. In “At Dandi” you’ll hear the joy and the victory. The Wisdom of the playing Koala’s is one-pieced work based on the combination of the Gamelan techniques with evolving counterpoint spelling. The simultaneous use of European and non- European concepts results in a work where colours and rhythms become one in an almost filmique atmosphere. 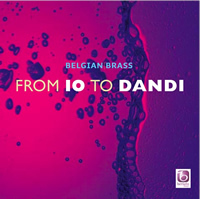 Io is a three-parted work that originally was composed in 1991 for the brass quintet “Belgian Brass Soloists”. 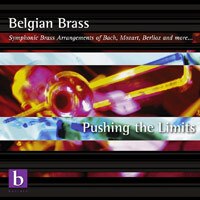 In 2004 the composer orchestrated it for brass ensemble and percussion especially for Belgian Brass. The title refers to the Jupiter moon Io, were enormous volcano explosions take place. The peace has a powerful and energetic sphere, where all instruments are driven to the extend of their possibilities. ‘Sfere’, is partly build on improvisatory and aleatoric cells, and partly on coloured chords. The extensive use of mutes and diverse techniques and effects at the percussion create a special atmosphere, and illustrate the fairy-like aspect that can be achieved with this instrumental combination. Also the notes formed by the letters of ‘Belgian Brass’ are used as the foundation of the melody. ‘Fugato e Corale’ is more virtuosic and dynamic: based on a 10- measure scheme and continuously changing metra in the percussion, a fugato theme is exposed by the brass players from high to low. This is followed by a choral, presented by the so called ‘soft brass’. A short Candenza for tuba leads back to the fugue, but in reverse: the bass begins and plays the exact same melody as the higher voice did before: a mirror picture. The melody of the choral starts all over in combination with melodic and rhythmic elements from the fugue, which leads to a whipping finale, solemn and surprising. ‘Canzona (Ommaggio a Giovanni Gabrieli)’ is an extensive homage to a Venetian Master who was very important for the instrumental music in general, and for brass players in particular. Therefore, this part is written in a neo- renaissance style, varied with more contemporary passages where bitonal sound-structures are colouring the part. The technique “ Cori spezzati” is applied literally and figurative: the ensemble is indeed divided into groups, who dialogue and contrast with each other from a distance. The beautiful San Marco Basilica is consequently staged in a modern way: old and new become united in a harmonious way, and a radiate final chord closes this brass trilogy. 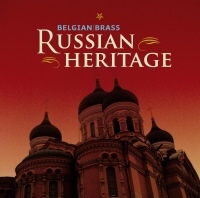 Together with Belgian Brass you’ll make a musical trip through the Russia of the 19th and 20th century and meet some of the most beautifull pieces, composed by popular russian composers. Along with Balakirev, Borodin, Cui and Rimsky-Korsakov, Modest Petrovitsj Mussorgsky (1839 – 1881), was a member of the so-called “Mighty Handful”, better known as “The Five”, who were among the most important Russian composers of the late 19th century. Despite his passion for music, as son of an impoverished landowner he was educated at a military academy, which prevented him from receiving a complete musical training. That is why several of his pieces were orchestrated by other composers, including his famous “Pictures at an Exhibition’, orchestrated by Ravel as well as “Night on Bald Mountain, orchestrated by Rimsky-Korsakov. “Night on Bald Mountain” was originally titled “St. John’s Night on Bare Mountain” and was initially intended as an opera based on the theme of a witches’ Sabbath. Very soon, Mussorgsky wanted to turn it into just a work for orchestra and he ended up working on it for 13 years. Yet for many, the work was unplayable as he had composed it and despite passionate attempts by a profoundly unhappy Mussorgsky it was never even performed. Only after Rimsky-Korsakov reorchestrated it 5 years after Mussorgsky died of alcohol poisoning, this brilliant work was performed for the first time in 1887. Dimitri Dmitrievich Shostakovich (1906-1975) already acquired the status of ‘star composer’ at a young age, during the Lenin era. In the early years of Stalin too, he enjoyed great respect in the Russian cultural establishment. However his opera “Lady Macbeth of the Mtsensk District” and the conflict that ensued after Stalin attended a performance of this opera in 1936 (read more about this in track 4) meant the end of his total artistic freedom and the start of a repressive policy that was to mark Shostakovich for the rest of his life. The “Jazz Suite No.1” composed in 1934 was originally an entry for a state-sponsored jazz composition competition. Yet the music has little to do with real jazz and has more to do with the agility of the music than with the typical features of jazz. Remarkable for Shostakovich is the use of a saxophone and a banjo in this suite, which sometimes resembles the music of Kurt Weil, which may not be by accident. After all, Shostakovich regularly includes quotations from works by other composers, including Rossini, Wagner and Mahler. This first suite is purer and simpler than the second; one of the melodies from the latter was used in Stanley Kubrick’s last film “Eyes Wide Shut”. Dimitri Dmitrievich Shostakovich (1906-1975) (read more in track 3), was a composer who had strong political views. This opera, with a libretto by Alexander Preis and based on a story by Lesvov, tells the tale of a lonely, unhappily married woman, Katrina, who falls in love with Sergei, a servant of her husband Zinovy and they murder him in an act of desperation. In the socially critical tale that takes place in the 19th century, the existing conventional conservative and moral values are questioned. This caused controversy in the upper circles, where the story was called ‘pornographic, anticlerical, coarse and provincial”. Yet the work was a hit with the public and no fewer than 180 performances were given between 1934 and 1936. However in 1936, Stalin attended a performance which he left in anger at the intermission, along with his political staff. Stalin, who called “Lady Macbeth” an anti-Soviet cultural crime and “not music, but chaos” forbade further performances and placed Shostakovich on a blacklist. Likewise an enjoyed 5th Symphony could not save the disrupted relationship and signalled the start of a long ordeal for Shostakovich. He kept on composing prolifically nonetheless and his music was now typified by cynical elements with touches of black humour. Alexander Nikolayevich Tcherepnin (1899 – 1977) left Russia in 1917 after the Russian Revolution and stayed for a while in France before ending up in the United States, where he acquired American citizenship. Despite the fact he came from a musical family (his father Nicolai Tcherepnin was a respected conductor and composer) and composed a large number of works, even up to present day he is still not a very well-known composer. This could be due to the fact that he was not afraid to experiment and he wrote many works in which there is more focus on the technical aspect than the musical one. He created his own 9 tone series that would later become known as the “Tcherepnin series”. Also interesting about his music is the versatility in a variety of areas. For instance, on the one hand he sometimes uses unusual combinations of instruments, including in his “Sonatina for Timpani and Orchestra” opus 58, or his “Concerto for Harmonica and Orchestra” opus 86. On the other hand, he got his inspiration from traditional Persian, Japanese and Chinese music. His “Romantic Overture” opus 67 of 1942, in which associations with Borodin, Rimsky-Korsakov and Rachmaninoff are clearly audible, is a work that is seldom played and is therefore widely unknown. Igor Fyodorovich Stravinsky (1882 –1971), is considered as one of the most important composers of the 20th century. Not only did he go through a pronounced and wide-ranging personal artistic evolution, but to a great extent he also set the norms of contemporary music history. His meeting with Sergey Diaghilev, who created the “Ballets Russes” in Paris was a determining factor for Stravinsky’s life and work. After all, the ballet music for “The Firebird”, “Petrushka” and “The Rite of Spring” were commissioned by Diaghilev and gave Stravinsky the status of a cult star. The cultural revolution in 1917 as well as the outbreak of the First World War initially caused Stravinsky to travel to Switzerland and then to settle in Paris where he acquired French nationality. With the outbreak of the Second World War, he emigrated to the United States where he acquired his third nationality. Versatility is probably the main characteristic of his work; he wrote the most varied music in which he always created a new style. The three-part ballet music from “Jeu de Cartes”, which premiered in New York in 1937, is a perfect example of this. At the end of his life, he turned to twelve-tone composition which was probably his greatest stylistic leap. Giovanni Gabrieli (1554/57-1612) is undoubtedly the most important representative of Venetian music from the end of the 16th through the beginning of the 17th century. As from when he followed in the footsteps of his uncle Andrea in the City of Doges in 1585 as the composer of liturgical services in St Mark’s Basilica, he not only continued developing the tradition of the polychoral vocal style a cori spezzati (i.e. using divided choirs: the acoustics and the specific construction of the basilica with its large, high galleries made it possible to split the choir into two sections and have them sing in turn, creating a veritable dialogue), he also had an outstanding instrumental ensemble at his disposal, to which the greatest virtuosos of the period, including cornetti players Girolamo Dalla Casa and Giovanni Bassano, belonged. His compositions for St Mark’s were published in two Sacrae symphoniae bundles. The instumental canzonas and sonatas they contain were almost certainly intended to be heard at mass and versper services on the main holidays and celebrations throughout the liturgical year. The ten-part, double-choir Canzon Duodecimi toni clearly illustrates how Gabrieli managed to highlight the virtuoso abilities of his ensemble. While the heart of the works of Johann Sebastian Bach (1685-1750) lies in religious music, his worldwide orchestral music also plays an important role. Alongside Musikalisches Opfer, the Kunst der Fuge and a large number of concerti, between 1725 and 1741 he also composed some four orchestral suites for varying combinations which all consist solely of an opening followed by a set of dance movements that follow one another in succession, clearly under the influence of the French style. The first of these suites dates back to around 1725 and was originally composed for 2 oboes, bassoon, strings and basso continuo. When Wolfgang Amadeus Mozart (1756-1791) severed all ties with his boss Count Colloredo in 1781 (thus becoming the first freelance composer ever! ), he had far more freedom to determine what and how he would compose. He found the ideals of liberty and humanity to which he subscribed reflected in Beaumarchais’ play Les Noces de Figaro, which conveyed the spirit of the French Revolution. Against the recommendation of the censure committee (the ideas were too revolutionary and too modern), but with the support of King Ludwig ll, between October 1785 and April 1786, Mozart used this play as a basis for composing his opera Le nozze di Figaro, a masterpiece that continues to be one of the most popular works in opera repertoires around the world. The opening immediately sets the tone for the whirlwind of events in the folle journée described in this opera. Richard Wagner (1813-1883) Der Ring des Nibelungen is undoubtedly one of the most megalomaniacal projects in the entire history of opera: four entire evenings worth of music, together some sixteen hours of musical drama, tell the tale of the downfall of the world (or at least of the gods) through their quest for power. The dramatic apex of the entire cycle takes place in Götterdämmerung, the last part of the Ring: this is the moment when forces of evil kill the young hero Siegfried, upon whom the hope of a new world rests. After his death, Siegfried is given a moving funeral march, in which Wagner uses a series of leitmotifs to characterise him as a heroic and dramatic character. Dmitry Kabalevsky (1904-1987) gained some limited acclaim with his second symphony, but made his first definitive breakthrough, both in his homeland of Russia as well as abroad, with his first opera, Colas Breugnon (1838), which he composed based on the story by Frenchman Romain Rolland. While stylistically speaking Sergey Prokofiev served to a certain example as his example, Kabalevsky never dared go as far with the harmony, and was far more conventional in terms of the form. But this certainly did not prevent Colas Breugnon from becoming a brilliant piece, haunted by a French ghost, with themes influenced by stylised folk music. Maurice Ravel (1875-1937) was well-known as a marvellous orchestrator with his broad orchestra pallet and his unending richness of colours. He applied this principle with great success to the works of other composers – just think of Moussorgsky’s Picture at an Exhibition – but also to his own compositions for piano. The best-known example of this is definitely the melancholic Pavane pour une infante défunte, a piano work from 1899 that he himself orchestrated in 1910. Althrough Ravel later judged the work very critically, the orchestral version has grown to become of his best known works. As famed as Ravel for his Pavane is Alexander Borodin (1833-1887) for his Polovtsian Dances. Originally these dances were part of the opera Prince Igor – in the second act, the Polovtsian Khan uses these dances (among others) to entertain his captive, the Russian Prince Igor – but they were actually created in the orchestral form before the opera was performed. These virtuoso dances, with their raw sensual sounds, illustrate the fascination of 19th century Russia with musical exoticism. Le carnaval romain, the “ouverture caractéristique” by Hector Berlioz (1803-1869), also originates from the world of opera. Berlioz wrote this symphonic work in 1844 as a kind of second opening to his opera Benvenuto Cellini. Just like the opera, which in his own words contains “a variety of ideas, an energy and exuberance and a brilliance of colour such as I may perhaps never find again”, so too does this opening burst with a richness of unheard-of energy and ideas. Berlioz was not only the composer who pushed the technical and coloration possibilities of the orchestra – even before Wagner and Ravel! – to far beyond the limits of his time, he also continues to be a great source of inspiration today to push those technical limits even further. Quod erat demonstrandum.